Starbucks is apologizing after two African-American men were attested at a Center City location. Philadelphia Police Commissioner Richard Ross said that, despite the controversial outcome, Philly police were just doing their job. The CEO of Starbucks reiterated Monday that the arrest of two black men inside one of the coffee chain's Philadelphia stores is "reprehensible and wrong," and said he hopes to meet them to discuss a constructive solution. "First, I’d like to apologize to them in person, and I’d like to have a dialogue with them to ensure that the opportunity to really understand the situation and show some compassion and empathy for the experience they went through," Kevin Johnson, who flew to Philadelphia Sunday, said on "Good Morning America" Monday. "And finally, as we work to solve this, I'd like to invite them to join me in finding a constructive way to solve this issue." Starbucks spokesman Reggie Borges confirmed to NBC News that the two men agreed to meet with Johnson on Monday. Stewart Cohen, the attorney representing the men, said he hoped the conversation will be "productive." “We hope to have productive conversations with the hope that something productive for the community can come out of this,” he said outside his Center City law office. The meeting happened in private Monday, a Starbucks spokesperson confirmed to NBC News. Johnson is also met Monday with Philadelphia Police Commissioner Richard Ross and Mayor Jim Kenney. Video shows several police talking quietly with two black men seated at a table. After a few minutes, officers handcuff the men and lead them outside as other customers say they weren't doing anything wrong. The men had reportedly been waiting for a friend. Police responded to the Starbucks store after an employee called 911 to report the men were trespassing, said Ross. He said officers were told the men had come in and asked to use the restroom but were denied because they hadn't bought anything. He said they then refused to leave. 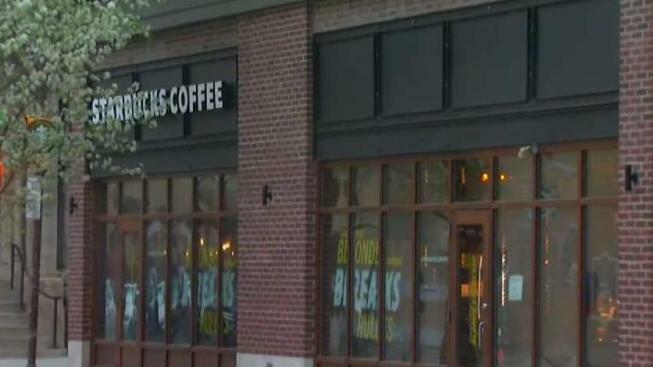 A Starbucks spokeswoman said the store where the arrests occurred has a policy that restrooms are for paying customers only. In the video, no Starbucks items are visible in front of either of the men. Starbucks sells itself as a community gathering spot as much as a coffeehouse, a welcoming place with comfortable chairs for lingering, trendy music and Wi-Fi. That's one reason the arrest of two black men who were sitting in a Starbucks struck a nerve for so many: They were doing exactly what people do at most any of the chain's 28,000 stores worldwide. Johnson noted that while different regions put in some slightly different guidelines of scenarios in which police should be called, like if there are threats and disturbances, "in this case none of that occurred. It was completely inappropriate to engage the police." He said the incident has given the company an opportunity to provide employees with clarity on Starbucks' guidelines and training in "unconscious bias." "Starbucks was built as a company that provides a warm welcoming environment for all customers, that didn’t happen in this case, that I know," Johnson said. "So it's my responsibility to ensure that we review everything." Asked if the worker will face any disciplinary actions, Johnson said while it's easy to blame one person, his responsibility is to look at the broader circumstances, including the type of training the employee received, that led to the decision to call police and ensure "this never happens again." "I will fix this," Johnson said in a video message posted on the company's website Monday. Meanwhile, about two dozen chanting protesters returned to the Center City Starbucks for another day of demonstrations. The protesters gathered outside the store in the pouring rain before 7 a.m., while inside it looked like business as usual. However, most people drinking coffee at the tables were regional leaders for the company's corporate side. The location was closed after the protests with the store's shades drawn. The store was open for business Tuesday morning. Over the weekend, demonstrators called for the firing of the employee who contacted police. On Monday afternoon, the coffee chain said the manager no longer works at that location.